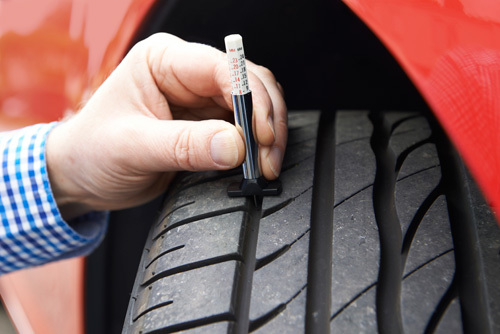 UK law stipulates that your vehicle must be fitted with the correct tyre type and size and also that the tyres are inflated to the manufacturer’s recommended pressure. The minimum limit a tyre should reach before it is classed as illegal is 1.6 mm, across the central ¾ of the tyre tread (pattern) around the complete circumference of the tyre. Many manufacturer’s actually recommend changing your tyres once they reach 3mm, as performance can start to decrease significantly below this level, especially braking distances. Driving a vehicle fitted with an illegal or defective tyre increases your chance of receiving a Fixed Penalty Notice. The maximum fine a court can impose per tyre is £2,500 and 3 penalty points added to your licence.